Legendary ski and climbing resort, rich in tradition and natural ambience. Close to lifts over the border to Chamonix, which is included for one day on the lift pass, as is the fellow Aosta Valley resort of Pila. These lifts were renovated in a €110m four-year project completed for the 2015-16 ski season. When will it snow in Courmayeur? The next notable snow forecast for Courmayeur is 7cm3in, expected on 24 April, with around 68cm27in forecast over the next 7 days. The Italian Ski Resort of Courmayeur is part of the Aosta Valley ski area with access to 352km219 miles of downhill skiing, with 180 marked pistes, served by a total of 62 ski lifts. In addition to the skiing in Courmayeur itself (50km31 miles of pisted ski runs), the appropriate ski Lift Pass will allow you to ski or snowboard in the other Aosta Valley ski resorts of Breuil-Cervinia, Crévacol, Etroubles, Pila and Saint-Rhémy-en-Bosses. With ski lifts as high as 2,760m9,055ft, skiing and snowboarding is assured throughout the season. The historic mountain town of Courmayeur sits on the Italian side of Mont Blanc, western Europe's highest mountain. The mountain scenery around Courmayeur is spectacular, with 14 4,000m plus mountain peaks above. The resort is one of several internationally famous centres in the Aosta Valley which runs up Italy's north west border with France and Switzerland. Unlike Chamonix, Courmayeur is a very atmospheric resort where ancient buildings huddle around cobbled streets so that the whole place oozes traditional charm. Planners have allowed a few ugly concrete blocks to appear (some of them four star hotels!) but these are on the outskirts of the town and don't detract from the ambience of the whole. Courmayeur can boast three centuries of tourism, far exceeding its long history as a winter sports destination, with visitors originally coming to experience the benefits of local mineral springs. The clientele has always included the great and the good, including the Italian Queen Margaret of Savoy who was such a valued customer that the owner of the Royal Hotel in the village built a special annex for her visit in 1880, named The Queen's Pavillion. There are other well known resorts in the area, such as Cervinia, lift-linked to Zermatt in Switerland, Pila and La Thuile (also lift-linked over a border, this time to La Rosière in France), all sharing an Aosta Valley joint lift ticket (your own transport a big advantage in making use of it). The longest possible descent in Courmayeur is 10km6 miles long and the most difficult run is the 'Competizione'. Courmayeur can offer skiing for all standards, including famous runs such as the resort's World Cup Downhill and the International, a 6km (4 miles) run which drops 1000m (aprox 3500 feet) as it descends. Many runs are covered by snowmaking and the resort has a very good snow record. There are two main ski areas. The largest, Chécrouit - Val Veny, directly above the resort, is largely suited to beginners and intermediates although there are some testing off-piste descents from top to bottom which may be undertaken with the assistance of a guide. Serious skiers are likely to head for the more limited lift network of Mont Blanc, which serves steeper, more spectacular trails and links over to Chamonix which, along with Argentière further up the Chamonix Valley, is included on the Courmayeur lift pass. Beginners have wide open slopes to gain confidence on, with tuition from the Mont Blanc Ski School, founded in 1936 and one of Italy's oldest and most prestigious. Intermediates are the most spoilt having both the wide open spaces and testing routes above Courmayeur and the ability to tackle the incredible runs that are unique to Mont Blanc. There are several excellent skiing excursions on offer for skiers of intermediate standard and up, aged 10 or over, offered by the Alpine Guides Society of Courmayeur. The Guide Society was established in 1850 as a free association of Alpine professionals. The most famous run is the 20km (13 mile) descent of the Vallée Blanche down to Chamonix from Helbronner Point (3369m), reached in half an hour from the La Palud cable car station. The descent takes around 4 - 5 hours allowing for breaks for food, drink and photographs. Once in Chamonix participants traditionally enjoy a gigantic beer before returning to Courmayeur by bus through the Mont Blanc Tunnel. For more experienced skiers there is a 2000 metre vertical descent down to La Palud which begins at Helbronner Point and continues over the Toula Glacier, after which it is named. Other popular runs are the Col d'Arp, l'Arp Veille and the Couloir of Dolonne. Finally The guides offer heliskiing excursions to the best runs around the Aosta Valley, which offers some of the most extensive off-piste skiing in Europe. Finally, cross country skiers are also spoilt for choice with up to 35km (22 miles) of trails to enjoy around this part of the Aosta Valley. One of the last major resorts to create a snow park, Courmayeur's is located at Aretu Area, 2,000m up and features beginner and advanced rail areas, two double Kicker lines, a jib area and a Big Air Bag. We don't currently have confirmed season dates for Courmayeur. NOTE:- Lift and Piste openings are always subject to Snow Conditions in Courmayeur. Courmayeur is able to make snow, on 15km9 miles of ski runs, with 280 snow cannons. The 21 ski lifts of Courmayeur are able to uplift 8,400 skiers and snowboarders every hour. Courmayeur is in the Italian Alps in Aosta Valley, Italy. The nearest airports to Courmayeur are Geneva, Annecy and Sion. There are 10 airports within three hours drive. The resort's main street is a joy for après skiers with numerous bars and cafes dotted around the pedestrianised centre. After the lifts close the Roma is a popular meeting point, whilst many just like to parade around window shopping for a while before getting ready for dinner. The buzz increases dramatically when well-dressed weekenders arrive from Turin and Milan on Friday through to Sunday to fill the resort. There are many famous and popular bars including Bar Roma, American Bar, Caffé della Posta, Caffé del Centro, and the Cadran Solaire. There are a couple of nightclubs. Other possibilities include a trip to the casino in St. Vincent. Want to Know when it Snows in Courmayeur? 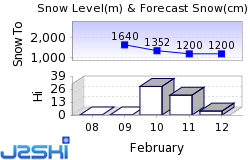 Click above to get Snow Reports by e-Mail for Courmayeur. By doing so, you agree to Our Rules. 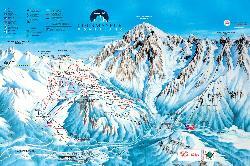 Other popular Ski Areas near Courmayeur. Want to ask about skiing and snowboarding in Courmayeur? Or contact Courmayeur Tourist Office. Note :- The information on J2Ski concerning Courmayeur, where not clearly factual, is opinion only and is neither definitive or exhaustive.